Daher ist die Aufgabe nicht sowohl, zu sehen, was noch keiner gesehen hat, als bei dem, was jeder sieht, zu denken, was noch keiner gedacht hat. The task is, not so much to see what no one has seen yet; but to think what nobody has thought yet, about that which everybody sees. English translation as given in an Epigraph by Ludwig von Bertalanffy, Problems of Life: An Evaluation of Modern Biological Thought (1952), Vol. 1, (1949, 1952). Original German, at least as early as Schopenhauer and Frauenstädt (ed. ), Second Edition of Parerga and Paralipomena (1862), Vol. 2, 116. Quoted in Julius Frauenstädt (ed.) Schopenhauer-Lexikon: Ein philosophisches Wörterbuch, nach Arthur Schopenhauers sämmtlichen Schriften und handschriftlichem Nachlass (1871), 180. This quote has been widely (apparently) incorrectly attributed to Erwin Schrödinger, for example, in Alan L. Mackay (ed. ), A Dictionary of Scientific Quotations (1991), 219. Mackay cites Bertalanffy, without page number. Did Schrodinger ever use Schopenhauer’s quote? If you know a primary source for Schrödinger, please contact Webmaster. Prior to this revision on 15 Jun 2015, the quote appeared on this site on the Schrödinger page. This was independently researched by this Webmaster. If you use it elsewhere, first request the credit line and link to include. A person is smart. People are dumb ... Fifteen hundred years ago everybody knew the Earth was the center of the universe. Five hundred years ago, everybody knew the Earth was flat, and fifteen minutes ago, you knew that humans were alone on this planet. Imagine what you'll know tomorrow. As quoted in interview about earthquake predictions for magazine article in Joshua Fischman, 'Falling Into the Gap', Discover (Oct 1992), 13, No. 10, 58. The article writer appears to be quoting, but throughout the article has used no double quote marks. The article is also online. Attributed. For example in I.J. Good, The Scientist Speculates (1963), 15. 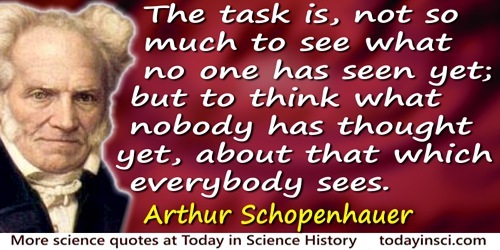 However, this seems to be a variant of a much earlier quote by Arthur Schopenhauer: “The task is, not so much to see what no one has seen yet; but to think what nobody has thought yet, about that which everybody sees.” See the Arthur Schopenhauer Quotes web page on this site for the original German and citation. Everybody firmly believes in it [Nomal Law of Errors] because the mathematicians imagine it is a fact of observation, and observers that it is a theory of mathematics. In 'Reflection on the Atomic Bomb', Yale Poetry Review (Dec 1947). Reprinted in Robert Bartlett Haas (Ed. ), Reflection on the Atomic Bomb: Volume One of the Previously Uncollected Writings of Gertrude Stein (1973), Vol. 1. Everybody likes to hear about a man laying down his life for his country, but nobody wants to hear about a country giving her shirt for her planet. In 'The Wild Flag', The New Yorker (9 Sep 1944), 35. Quote collected in In the Words of E.B. White: Quotations from America’s Most Companionable of Writers (2011), 150. In David Chronenberg and Chris Rodley (ed. ), Chronenberg on Chronenberg (1992), 7. As cited in Carl Royer, B Lee Cooper, The Spectacle of Isolation in Horror Films: Dark Parades (2013), 55. For it is obvious to everybody, I think, that this study [of astronomy] compels the soul to look upward and leads it away from things here to higher things. I have always considered my work a joint effort. I was fortunate to have worked on great ideas and with very intelligent people. I may have developed a few equations no one had thought of before but that was nothing unusual—everybody did that. I pray every day and I think everybody should. I don’t think you can be up here and look out the window as I did the first day and look out at the Earth from this vantage point. We’re not so high compared to people who went to the moon and back. But to look out at this kind of creation out here and not believe in God is, to me, impossible. It just strengthens my faith. From NASA transcript of News Conference by downlink from Space Shuttle Discovery during its STS-95 Mission in Earth orbit (5 Nov 1998). In response to question from Paul Hoveston of USA Today asking John Glenn about how the space flight strengthened his faith and if he had any time to pray in orbit. In Radio Lecture (30 Jun 1973) broadcast by the Open University, collected in Imre Lakatos, John Worrall (ed.) and Gregory Currie (ed. ), 'Introduction: Science and Pseudoscience', The Methodology of Scientific Research Programmes (1978, 1980), Vol. 1, 68. People exaggerate the value of things they haven’t got: everybody worships truth and unselfishness because they have no experience with them. Running overtime is the one unforgivable error a lecturer can make. After fifty minutes (one microcentury as von Neumann used to say) everybody's attention will turn elsewhere. In 'Ten Lessons I Wish I Had Been Taught', Indiscrete Thoughts (2008), 197. Scientists, especially when they leave the particular field in which they are specialized, are just as ordinary, pig-headed, and unreasonable as everybody else, and their unusually high intelligence only makes their prejudices all the more dangerous. Sense and Nonsense in Psychology (1957), 108. Karl Raimund Popper and William Warren Bartley (ed. ), The Open Universe: an Argument for Indeterminism (1991), 8. The world itself looks cleaner and so much more beautiful. Maybe we can make it that way - the way God intended it to be - by giving everybody that new perspective from out in space. The world looks marvelous from up here, so peaceful, so wonderful and so fragile. Everybody, all of us down there, not only in Israel, have to keep it clean and good. Why is that nobody understands me, and everybody likes me? In an interview in The New York Times, March 12, 1944. You make experiments and I make theories. Do you know the difference? A theory is something nobody believes, except the person who made it. 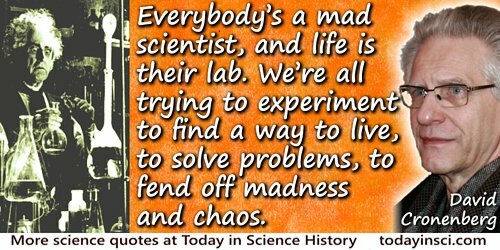 An experiment is something everybody believes, except the person who made it. Remark to Hermann F. Mark. As related by Herman F. Mark to the author. 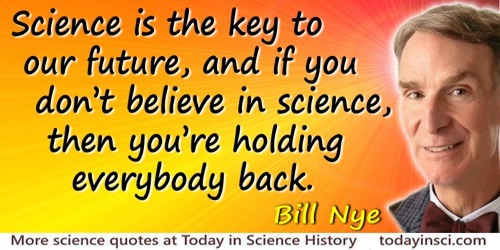 Quoted in Gerald Holton, The Advancement of Science, and Its Burdens, (1986), 13. ~~[Misattributed]~~ … the task is … not so much to see what no one has yet seen; but to think what nobody has yet thought, about that which everybody sees. This quote has been widely (apparently) incorrectly attributed to Erwin Schrödinger, for example, in Alan L. Mackay (ed. ), A Dictionary of Scientific Quotations (1991), 219. For an earlier authentic statement of this quote, see the Arthur Schopenhauer Quotes page on this website. Also see Albert Szent-Gyorgyi.